How do Neheb, the Worthy and Abyssal Nocturnus Interact? 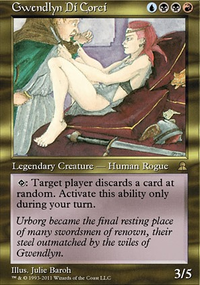 Well, when going for the CMDR kill, Mesmeric Orb is the card of dreams, where other cards aren't bad, like Vicious Rumors, they don't do enough to warrant me wanting their inclusion without the commander. 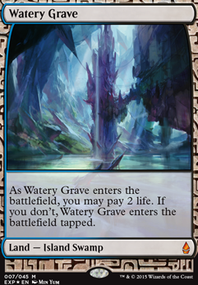 What should be kept is a lot of tutors, to fetch different cards, as well as a lot of ramp. Then a reasonably large hand disruption package, and finishing the deck off with some combos, and cards that do a ton to swing the board in your favor. Tutors: Demonic Tutor, Imperial Seal, Vampiric Tutor, Grim Tutor, Cruel Tutor, Demonic Consultation. Vicious Rumors, Abyssal Nocturnus, Fell Specter, Guul Draz Specter, Herald of Anguish, Hypnotic Specter, Liliana's Reaver, Myojin of Night's Reach, Needle Specter, Scythe Specter, Sewer Nemesis, Stronghold Rats, Wei Night Raiders, Whispering Specter, Ghoulcaller's Bell, Darksteel Plate, Ordeal of Erebos, Raiders' Wake, Bontu's Last Reckoning, Anvil of Bogardan, Putrefaction, Painful Quandary, Megrim, Fraying Omnipotence, Rise of the Dark Realms, Torment of Hailfire, Liliana Vess. Evil and Bad. Oh boy. 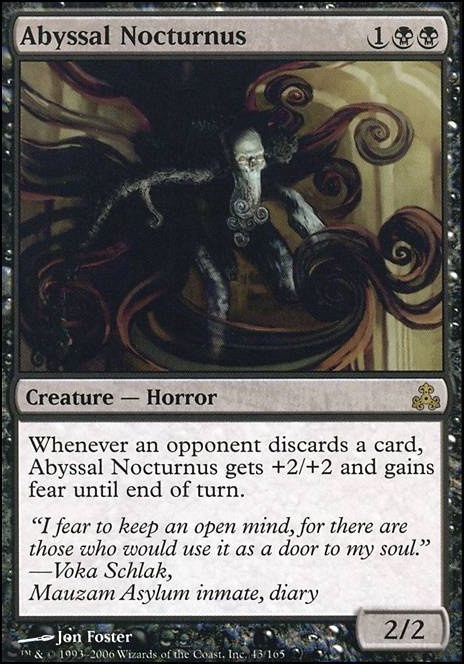 I'd consider Bloodghast over Abyssal Nocturnus, one turn earlier and has recursion seems worth it. 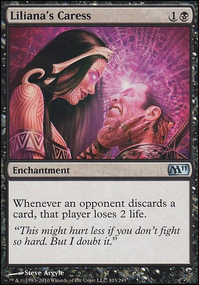 I could be very wrong, as a 4/4 is no joke, but in such a creature light deck that despite the burn has more of a mid-game win-con than aggro I would be concerned about blocking. Nyxathid, Abyssal Nocturnus, and Shrieking Affliction would be nice in discard heavy decks. 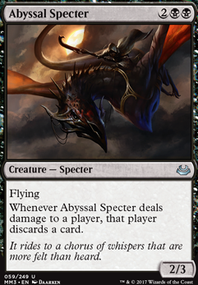 If you want the deck to be more creature heavy Fell Specter and Raiders' Wake are nice as well. Hypnotic Specter is also a good choice. Coughlincohen I decided to take out the zubera and put in two more Nyxathid and two Abyssal Nocturnus as I still tend to favor Nyxathid over Nocturnus. Thanks for the comments. If anything, I would swap out Ashen-Skin Zubera for Abyssal Nocturnus. You have a lot of quick discard in your deck, Abyssal Nocturnus would be a beatdown card that is a lot quicker than the Zubera. Hey Coughlincohen thanks for the comment and upvote. I was considering Abyssal Nocturnus but couldn't seem to find a spot for it. I pretty much had Nyxathid fill that role. What do u think I should swap out for it? Awesome Budget deck! Try Abyssal Nocturnus!